Lobster twice in one week? Ah! Such is life for a roving Londonista. The first time round was a Big Easy munch out in Chelsea. For our second lobster feast, we were at a more centraal location, Belgo Centraal on Earlham Street to be exact, sitting in on a lobster masterclass and learning about this wacky Belgian restaurant chain's upcoming Lobsterfest. With Belgo's executive chef Muir Picken (whom we'd like to hit up for Chefspective interview sometime) at the helm, Londonist worked our way through some of his selections for the upcoming crustacean centric June menu. We killed what we ate (don't worry, Belgo freezes its lobsters so they go “dormant” before being “dispatched” or cooked) and then helped assemble a lobster thermidor (with a Orval and Béchamel sauce), a red Thai lobster dish and a lobster salad. All dishes were made with “neutral tasting” Canadian lobster and were indeed satisfying. 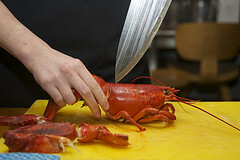 From £4.95 for a bisque to £24.95 for a “Whole Surf & Turf”, there's a range of items sure to please seafood lovers. And as you might expect from a Belgian eatery, beer's held in highest regard at Belgo. During our Lobsterfest session, we thought the Westmalle Dubbel Trappist beer was a nice match with the dishes we sampled. Lobsterfest runs through June at all of Belgo's five London locations. Visit www.belgo-restaurants.co.uk for more info.